Dodge County District Attorney William Bedker files criminal charges of assisted suicide against Joshua Walters, a Dodge Correctional Institution prisoner who helped to kill the guy who killed Madison activist Joel Marino. "By helping with the strangulation, holding him down, and several other things, which of course, is a crime. So, we take that very seriously." 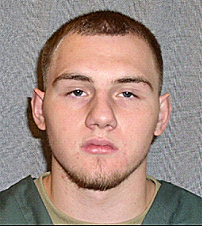 Dodge County Sheriff Todd Nehls says the charges follow an extensive investigation of the January 10th death of inmate 20-year-old Adam Peterson. What&apos;s the motive for Walters to help kill Peterson? "Well, I don&apos;t know what the motivation is to assist in a suicide. There was some mention that the cellmates may have made a suicide pact. You know, &apos;I&apos;ll help you and after you&apos;re dead I&apos;m going to kill myself.&apos; Of course that didn&apos;t happen." Walters faces a maximum sentence of six years in prison and $10,000 in fines if convicted. Nehls says it doesn&apos;t seem like enough. "To assist another person in a death and leave that person hanging there for an hour while you laid in your bunk before you alerted the correctional staff is very disturbing to say the least."